We recently updated our Level 3 Diploma and Extended Diploma qualifications to include a value for Total Qualification Time (TQT). TQT includes all the time needed to gain a qualification, including teaching (Guided Learning Hours, or GLH), assessment and other study e.g. independent study. The need for qualifications to have a TQT value is due to Ofqual’s move from the Qualifications and Credit Framework (QCF) to the Regulated Qualifications Framework (RQF), which was introduced in October 2015. The RQF is designed to help people to understand qualifications, providing detail on the challenge and size of each regulated qualification and how it compares in relation to other same level qualifications. It is a single, simple system for cataloguing all qualifications regulated by Ofqual. It’s like a bookcase in a library, with qualifications indexed by their ‘level’ and ‘size’. Further information on the changes introduced can be found on the gov.uk website. Levels indicate the difficulty and complexity of the knowledge and skills associated with any qualification. There are eight levels supported by three ‘entry’ levels. Size refers to the estimated total amount of time it could typically take to study and be assessed for a qualification. This can be anything from a matter of hours to several years of study and different students can take different amounts of time to study for the same qualification. Size is expressed in terms of Total Qualification Time (TQT). The part of that time typically spent being taught or supervised, rather than studying alone, is known as Guided Learning Hours (GLH). 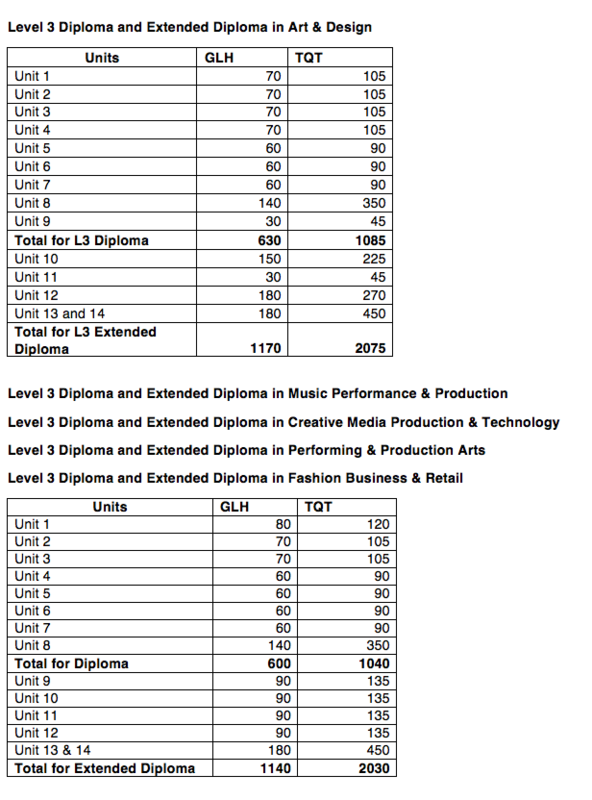 Level 3 Diploma and Extended Diploma in Fashion Business & Retail. We will be reviewing the size of our Level 1, 2 and 4 qualifications in the coming months and will assign Total Qualification Time for all the qualifications offered by 1 December 2017.